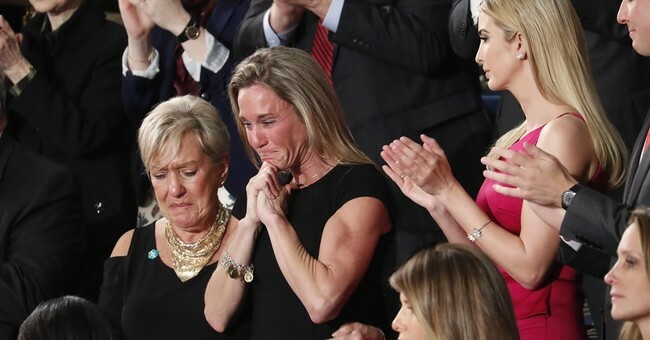 Carryn Owens, the widow of Navy SEAL Ryan Owens who was killed in action in Yemen back in January, was given a two-minute standing ovation. It was the longest standing ovation of the night and it was much deserved. Yet, on Twitter, some liberals viewed this (wrongly) as exploitation. It seems that Trump Derangement Syndrome is a horrible affliction and for one former Clinton volunteer—it cost him his job. A former Hillary Clinton volunteer drew swift condemnation -- and lost his job -- after mocking the widow of a fallen Navy SEAL who was honored by the president during his congressional address Tuesday night. Grilo’s LinkedIn page says he works as a principal for the Chicago-based Liberty Advisor Group. But as of Wednesday morning, Grilo’s profile page on the site had been deleted, and the company later confirmed that an employee had sent what they called "an offensive and inappropriate tweet" regarding the Gold Star family. In a statement, the company said that while the message was from his personal account, "his comments were inconsistent with the Company's values." "Regardless of whether the comments in the tweet were intended to cause the hurt and anger that they ultimately generated, they were unacceptable to us, and the individual who issued the tweet is no longer affiliated with Liberty," the statement said.